It was Mark Twain who is said to have claimed, 'reports of my death are greatly exaggerated', when his death was mistakenly reported in the New York Journal. Now so far as I am aware my death has not been reported in any obituary column, but recently listening to friends say kind things about me was somewhat funereal!. At funerals I have so often hoped that the words that are spoken about the deceased had also been uttered to the deceased before that person had died! So now I know. Just a couple of weeks ago some twenty of us went up to Colonsay in the Hebrides to celebrate my iminent 60th birthday. In addition to my small family, several friends kindly made the trek up. 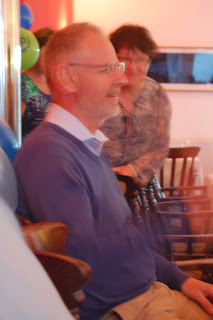 At the beginning of the celebratory meal my longstanding friend Dave Greaves spoke generously about me. I have to say I felt rather choked. And then just to put the nail in the coffin (so to speak), my pastor Ray Evans, also said some very touching complimentary words. That clinched it. Although I would love to have stood up and given a witty talk, I felt completely lost for words. I was truly moved by a sense of being loved. Now I haven't lacked for love, since I had wonderfully loving parents, I've had a devoted wife for 35 years, and two daughters who shower me with thoughtful love on a regular basis. But there was something about the coming together of friends and family, and the milestone that is 60 years of age, that just got to me. Am I going soft? Maybe. But to be loved and to know that you are loved is so crucial. Of course different people have differing ways of showing love (hence The five love languages by Chapman), but it does need showing. Some years ago I was at a James Taylor concert with my wife and daughters. He sang the beautiful song, Shower the people you love with love, show them the way that you feel. I have often thought just how important that sentiment is. Indeed it's not enough to feel the emotion of love, it needs demonstrating. So as a Christian I know I am loved, extravagantly, undeservedly and consistently.